The Antrim athlete remains untouchable as he stormed to 1500m glory. MICHAEL MCKILLOP ENHANCED his reputation as one of the dominant forces in Paralympics athletes with a victory so clear-cut he was afforded the luxury of savouring the moment as he crossed the line. The 26-year-old justified the odds-on favourite tag by defending his T37 1500m title, and adding a tenth major championship gold to his collection, with such conviction and composure that he didn’t need to even get out of second gear. Victory in 4:12.11 at Rio’s Olympic Stadium ensures McKillop remains undefeated at the Games after 800m glory in Beijing and London and now 1500m success in 2012 and 2016. Such was the margin of victory in London four years ago, it was expected McKillop would breeze to a fourth Paralympic gold here and so it came to pass, although more comfortably than anyone could have imagined. His success follows that of Jason Smyth, who claimed gold in this stadium on Friday, and the bronze medal won by Eoghan Clifford in the C3 Individual Pursuit. “Just an incredible experience, just to live up to people’s expectations is something that I have always seen as a tough thing to do,” an emotional McKillop said afterwards. “It’s mentally tough. Whenever you go to bed two nights in a row and Jason (Smyth) has got his (gold medal) on the bedside table, it’s a hard one to take. If truth be told, nobody really got near McKillop. Algerian Madjid Djemai set an early, but unsustainable, pace while up-and-coming Canadian Liam Stanley pushed hard to stay on McKillop’s shoulder, before being left behind on the final lap. The gap between first and second was four seconds. It was a devastating finish from McKillop who stormed to an emphatic victory in front of a large Sunday morning crowd of 30,000, before taking the acclaim from the home supporters on a victory lap. Meanwhile, Orla Comerford had to be satisfied with eighth place in the final of the T13 100m earlier in the day. The 18-year-old was well off her personal best, in a time of 12.87. 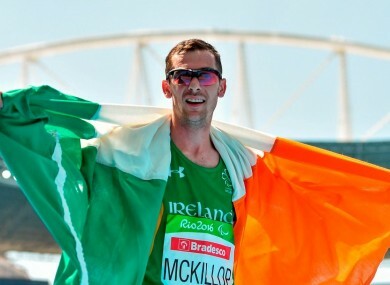 Email “Gold star Michael McKillop blows field away to defend Paralympic title in sensational fashion”. Feedback on “Gold star Michael McKillop blows field away to defend Paralympic title in sensational fashion”.